Remember? The guy from that commercial? When he was all like “WIZARD!”? Remember commercials before Netflix and AdBlock? 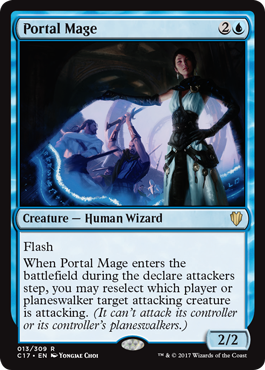 It’s no coincidence that I’m bringing that up because I want to talk about WIZARDS today and I’m capitalizing every letter in the word because, have you seen the Wizards in this deck? Every new card is gas. Gas, I tells ya. Let’s just get into it because these cards are bugnutty and they’re all worth discussing. In fact, I’m so excited that I’m reviewing every new card confirmed in the “Arcane Wizardry” deck. Enjoy! So this is a card. Skipping your draw step is something you may want occasionally, but let’s not pretend that’s upside necessarily. Not every line on every Wizard need be a good ability. What’s really good is his middle ability that lets you do a version of scry that’s even better in decks where your graveyard matters. As if that weren’t good enough, he also has the ability to use some of those cards to shrink a creature. 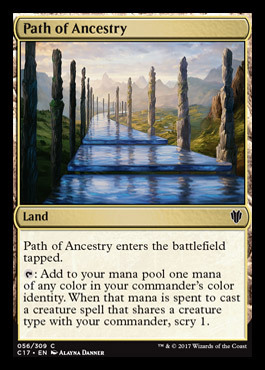 This goes in a lot of decks that already exist, most of them Sultai. Damia, Sage of Stone can’t wait for this Wizard, nor can Sidisi herself. The consensus on Reddit is that Taigam is probably not good enough to helm his own deck but might be a good support card in lots of other decks, which might explain the “mere” preorder price of $3 on SCG. Good card, not great, good place to start. Moving on. 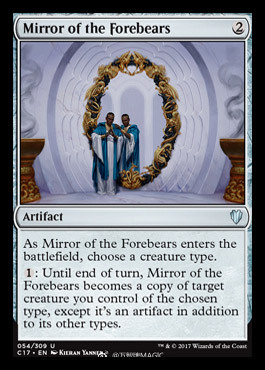 This is a solid, versatile card that does a lot of work, especially when you have Wizards with good tap abilities that you want extra copies of. Another card I would classify as “good, not great” I expect to see this show up on more EDHREC decklists than it really should. We call that the “Precon effect” and whenever a card isn’t great but seems good enough not to have to take out of the Precon, people leave it in. Another card would be better, but people don’t always build that way. Instead, they take out the garbage and replace the garbage with better cards, building from the middle up rather than the bottom up. Middle-up building leads to mediocre cards having higher EDHREC scores than they should. 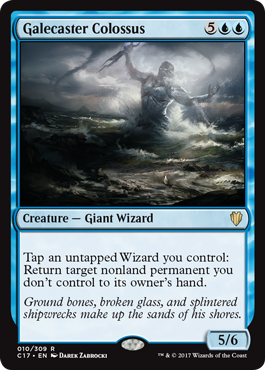 Be aware that seeing this registered in a ton of Wizards decks doesn’t necessarily mean it’s that good. SCG wants $2 for this and I’m not buying at that price. Cool card, though. This is a $0.25 preorder and that’s straight incorrect. 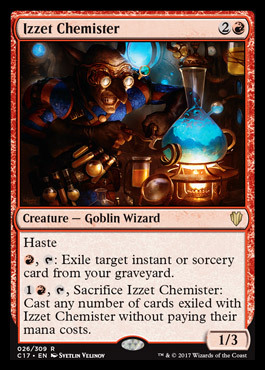 This card gives you a lot of extra mana and in aggressive red EDH decks, you want that. It also gives you artifacts which you can sacrifice to other things or just use to win the game with Hellkite Tyrant. You share the wealth, but so what? Is Mana Flare a bad card? No, it isn’t, and I think you buy this for a quarter and don’t look back. This doesn’t scale as well as some of the curses, and it scales better than others. 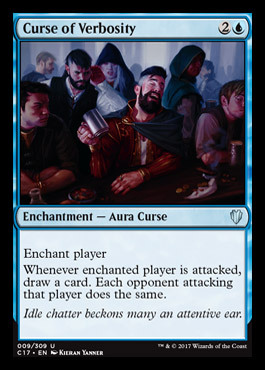 This is a pretty mediocre curse and unless you’re building curse tribal, I don’t see this making the cut. 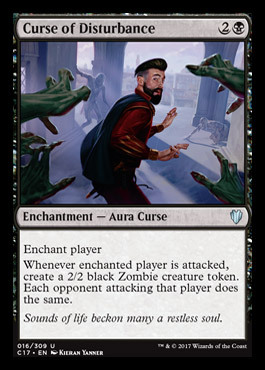 Getting zombie tokens is good, especially in decks where you can use them and this potentially ends up in token-heavy builds, but this doesn’t seem as likely to achieve the level of ubiquity I expect from Curse of Opulence. This sometimes draws you more cards that Rhystic Study, but not always. This also draws your opponents way more cards than Rhystic Study does. That’s good news for Nekusar, but that’s about it. Pass. If this gets much cheaper than its $3 preorder (high for a reason) I think you buy way in. This is a card with net demand since every deck built around the precon it comes in will include it, but also every tribal player with decks already built will be cutting a card to jam this. Coming into play tapped is fine when you’re scrying like mad and getting access to a second Command Tower. This might be the best card in the set, no hyperbole. It’s that good that often. 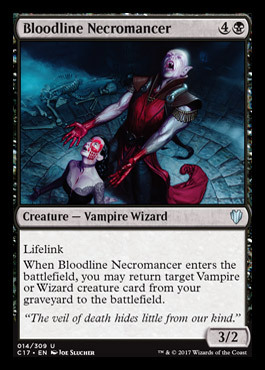 This is much better in the Vampire deck than it is in the Wizards deck. 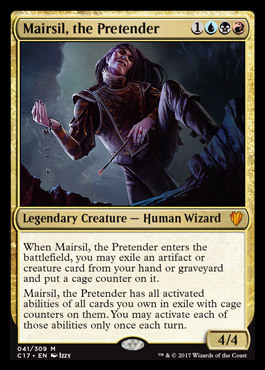 It’s my sneaking suspicion that anyone who buys the Wizards precon is going to immediately cut the “graveyard” sub-theme unless they’re playing Mairsil, the Pretender, maybe. Even if they don’t cut all of the “graveyard matters” cards, this seems a little expensive and maybe weak. That said, I love the idea of pairing this with Deadeye Navigator and a sac outlet, so maybe this ends up a real card after all. Then I remember how little play Thief of Blood gets in a world where Atraxa is the #1 deck every week on EDHREC, and I go back to realizing I can’t predict what players will do. This is in 2 decks, don’t even pay $0.50 for this. 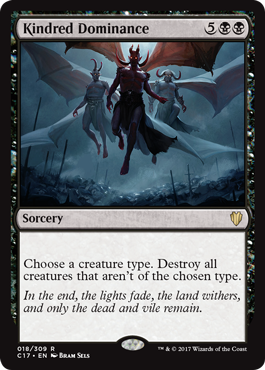 It took me a couple of hours to realize this said “destroy” and not “sacrifice” the token. That matters quite a bit. 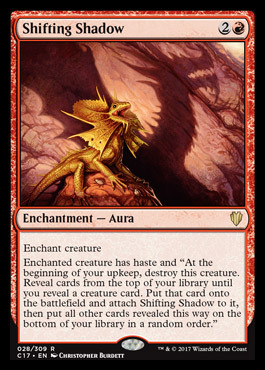 There’s a lot to unpack with a card with this much text, but I think it’s safe to say that this is the most “red” card in the set, and it’s not close. Chaos reigns supreme and this has the potential to be a Polymorph-type card. This grows an army if you can prevent the destruction, gives you triggers if you can benefit from it, and it generally chaotically changes your board state. This is fun, but I don’t know how good it is, yet, only that players love it. This looks like a very, very bad substitute for Snapcaster Mage, but the upside to the risk (exiling a lot of cards only to lose them if this card is killed our bounced) is that you can cast a lot of spells at the same time using this, which is great if you are an Aetherflux Reservoir deck, for example. I still think this is too slow and durdly, but I could see this doing a ton of work in a deck with Paradox Engine, Paradox Engine being a card that makes better cards than this better. I see the best case scenario on this card and I don’t see your opponents letting you do it, and that’s probably why I don’t like this card as much. Awww yiss. This is a CARD. You pick different things to do to different people? This is amazing. 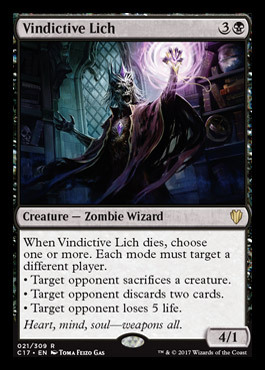 I want to kill and reanimate this as much as possible, and I bet Zombies players play this more than Wizards players do. This card is nutty, and I want to play Night of Souls’ Betrayal, and Lifeline with this stupid thing. Preorders went from $2 to $3 which isn’t anything to write home about, but it’s worth noting, I guess. This is just… FUN. We need cards like this. Meh. I like 7 mana wraths to do more than make me have to have a bunch of creatures and them not to have the same type of creature to work. This is Decree of Pain mana, it should be a Decree of Pain effect. That said, Mass Calcify is in like 2,500 decks on EDHREC so clearly there is a place for a card like this. People will play this. I’m pretty sure Robo Rosewater accidentally comes up with 3 cards every day better than this. This is a small effect for the cost of a card. Anytime I hate a card this much, I’m usually wrong about it (I said Electrostatic Pummeler was accidentally printed with the rare expansion symbol instead of common), but I still hate this card even knowing that. Hey, 2,684 people playing Mind’s Desire on EDHREC! 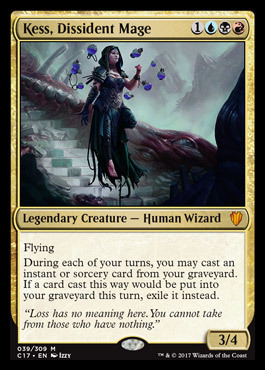 Ever wish your Mind’s Desire could be a killable creature with summoning sickness that didn’t even add the the storm count because you had to pass the turn after you played it? Me neither. I mean, this is a second copy of Mind’s Desire, I guess, and it’s less mana-intensive since it only costs U to activate the turn you go off, but I generally worry when my important effects are stapled to a fragile meat body. 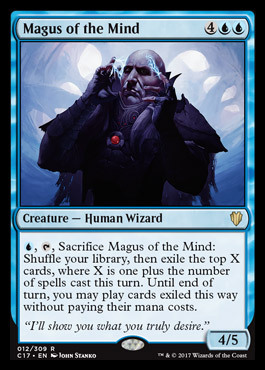 Then I look at the price of Magus of the Wheel and remember that no one plays removal in EDH, apparently. This card is probably better than I think it is and worse than you think it is. This card makes Tradewind Rider look like… a card that isn’t as good as Tradewind Rider by comparison. I’m bad at those; who am I? Dennis Miller? Even Dennis Miller doesn’t want to be Dennis Miller at this point. You know who else I don’t want to be? Your opponent when you start pulling their pants down with this bad boy. This is slow and expensive but once you get it going, you will make people miserable with this card. Soooo this is really good. I’m not sure what the best abilities to give this are, yet, but people are going to figure it out. This is a real build-around card but it’s at home in the 99 of a Grixis Wizards deck as well, provided you keep the “mill yourself” theme going, which isn’t something I’m 100% sure you want. This probably isn’t the set’s Atraxa but that just makes it the set’s Vial Smasher, which is still saying a lot. 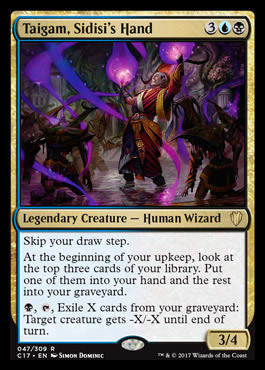 Even if this dies or is bounced or is exiled or is tucked (all code for “when you put this back in the command zone) you “remember” every exiled card and have access to it the way this is worded so make this your commander and find ways to recast or flicker it a ton (Deadeye ftw) and give this every of the abilities. 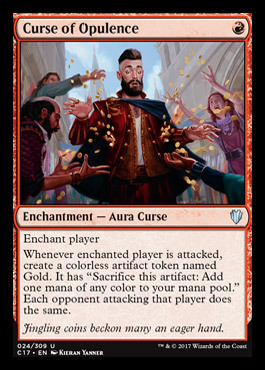 This card is stupid good and the mere $5 SCG wants for this seems pretty reasonable indeed. Expect very good, fun things from this card. Alex Kessler from Masters of Modern previewed this card, so good for Kess. This card could impact Legacy. If it does, this is a $20 card, maybe more. Atraxa is currently $20 and while this Wizards deck does a better job of spreading the value out, remember that Mind Seize had Baleful Strix in it, too. If you want the precon, preorder it. If you want to play with this, preorder it. This is the card everyone wants to build around and it’s not hard to see why. I saved this card for last for a reason. That’s how I feel about this set. Feel free to agree or disagree in the comments. Thanks for reading! I’m off to go watch that stupid commercial a bunch more times. 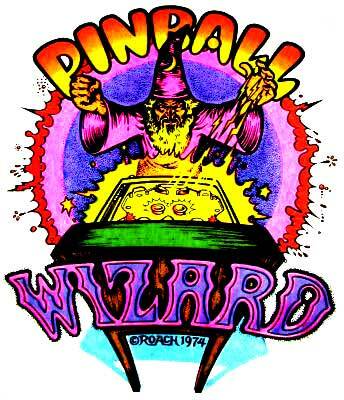 WIZARD! Jason is one of the hardest working writers in the game with a weekly column on Gathering Magic and MTGPrice and is a cast member of the Brainstorm Brewery and Money Draught podcasts. All that and he still finds time to manage content on EDHREC and struggle as a comedian. No wonder he's been called the Ryan Seacrest of EDH.